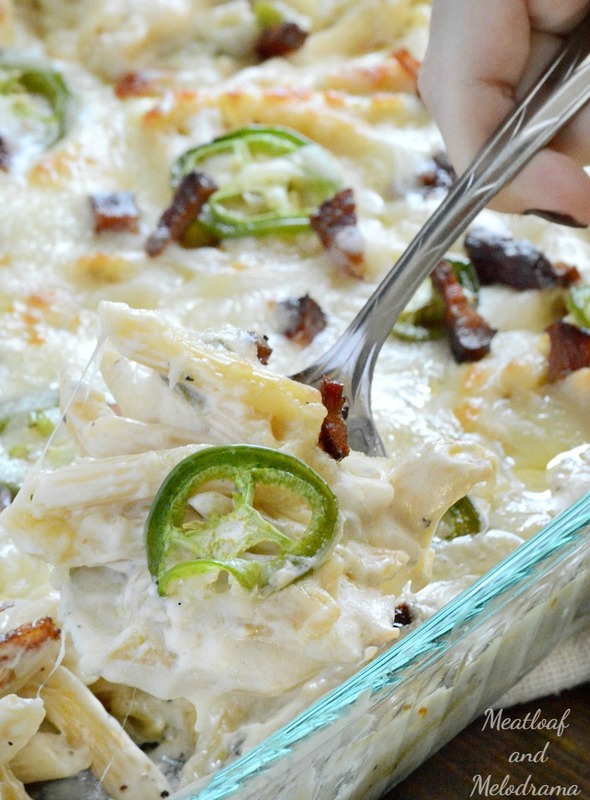 This delicious One Pan Jalapeno Popper Chicken Pasta is rich, creamy, cheesy and spicy. 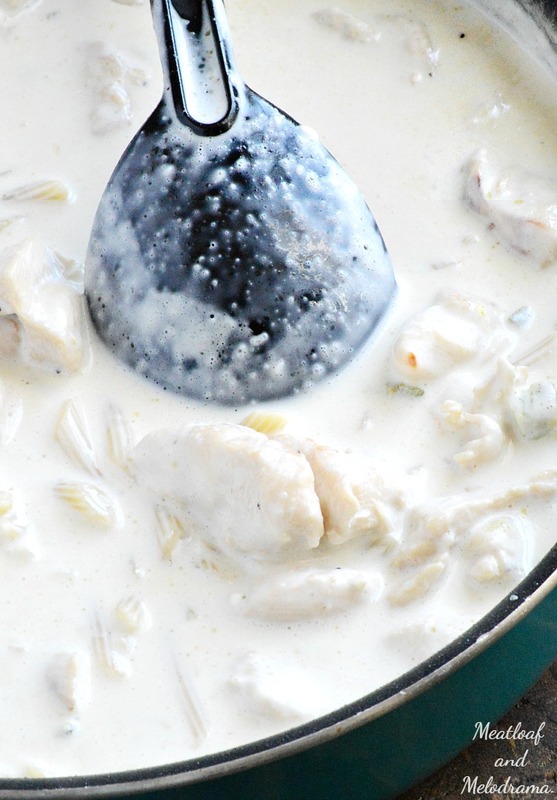 It’s the perfect easy game day dinner! You all know how much I love football, especially when there’s delicious food to go along with the game! 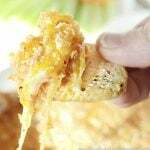 I’m always searching for game day recipes that are cheesy, spicy, easy to make and easy to eat. Honestly, when it comes to game day food, the spicier, the better. The only problem with that, my friends, is heartburn — ugh! But more on that in a bit. If we can’t attend the game, we make sure to watch it on TV. I usually make several different dishes on game days, set them out on the counter and let people just take what they want. It’s super casual, but fun. 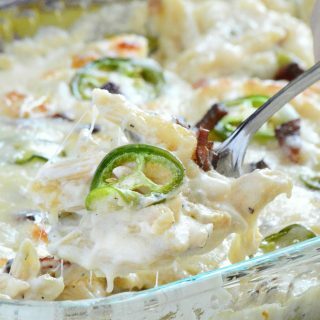 I’ve only made this spicy jalapeno popper chicken pasta dish couple of times, but it’s already a family favorite. Even the Hubs, who doesn’t like things too spicy, loves it. To make things easier and cut down on dishes, I cook everything in one pan, and then I transfer the mixture to a baking dish and bake it. Actually, if you use a foil pan for baking, you only have one pot to wash! Basically, I brown the chicken, along with some diced jalapeno peppers and onions. Then, I add the pasta and water. When the pasta is almost done, I make the creamy sauce in the same pan. In fact, you could stop at this point if you wanted to, but who can resist a pan of cheesy, ooey-gooey baked pasta? Now, let’s talk about the side effects of eating a lot of spicy, cheesy food — heartburn! Bummer, right? You know, I’ve been eating spicy food forever, but I never had any heartburn until I was pregnant with my youngest. And believe me, that was definitely not fun. Now, I only have problems after I’ve eaten too much spicy food, which seems to occur about every weekend in the fall or whenever my favorite team is playing! This one pan jalapeno popper chicken pasta is definitely spicy, but you can control the heat by using fewer peppers. And if you want more heat, you can toss in more jalapenos. I added some cooked bacon right before I put the pasta in the oven. This is optional, but bacon makes it even better! 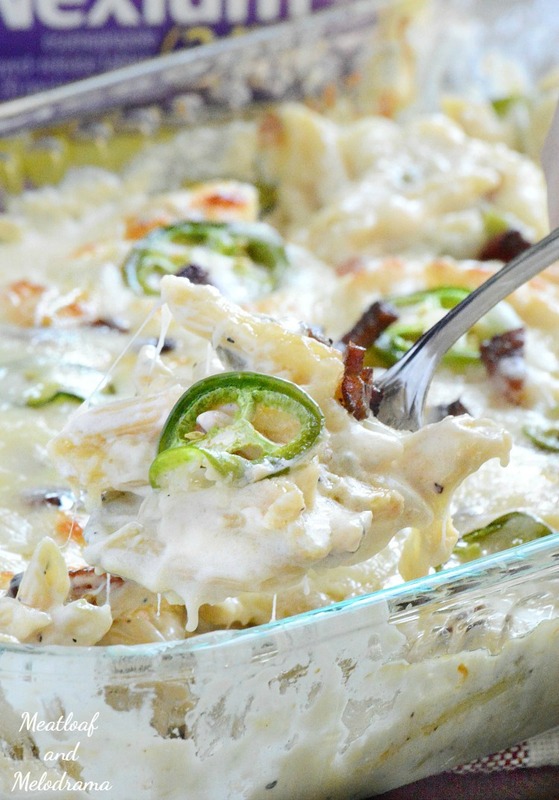 Cheesy, creamy penne pasta with jalapeno peppers and bacon. 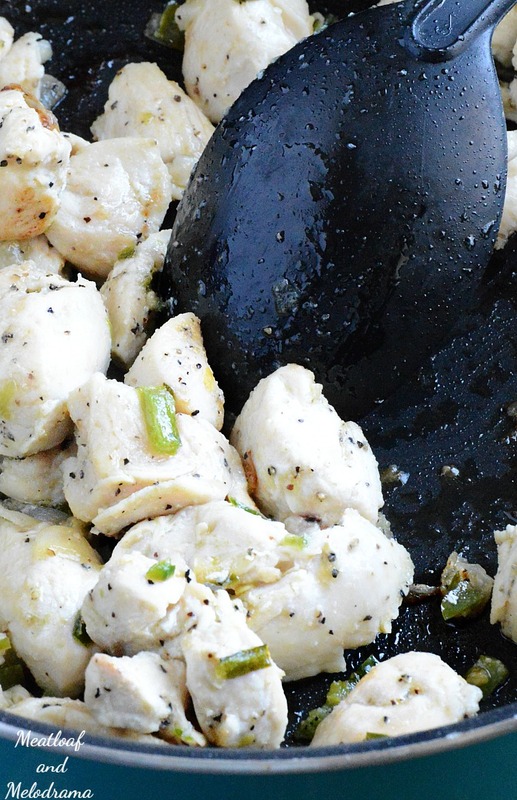 Cook it in one pan and bake it in another! You can skip the baking if you want and add the cheese before serving from the pan. Or, you can refrigerate pasta and bake later. Have a great game day! Best looking game day grub of the week! Thanks, Dorothy.This is one of our favorites for game day! Dee- this sounds like a Winner! Wow!! This is perfect for game day!! Looks delicious!! Holy smokes, this pasta dish looks amazing! Thanks, Laura. It disappears super fast! 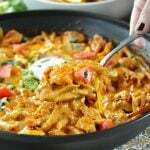 I love cheesy this chicken pasta looks! This looks absolutely GREAT! My family would go crazy for it…especially my husband! We will just love this casserole, it looks like our kind of meal. Thanks so much for sharing with us at Full Plate Thursday. Have a great weekend and come back soon! 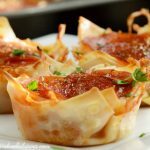 Your recipe is featured on our Top Ten Features at Full Plate Thursday this week. Hope you enjoy your new Red Plate and thanks so much for sharing with us!